You’ve made the decision, packed your bags, and are getting ready to head to one of the most culturally diverse cities in the United States. You’ve probably been researching what to do, where to go, and what to eat during your time in New Orleans. You may have even seen advertisements about going on New Orleans airboat tours online. While there are so many awesome experiences to be had in the city, there is also so much more Louisiana has to offer than just Bourbon Street. Louisiana is home to many types of animals such as alligators, nutria, egrets and many more! Experience another side of Louisiana culture and take a New Orleans airboat tour with Airboat Adventures. When you choose to hop on board one of our airboats, you’re signing up for the adventure of your life. Our cajun boat captains have years of experience and are very knowledgeable about the area. Not only will you get to see the indigenous creatures in their natural habitat, you’ll get to learn about the rich history of the bayou. Don’t miss out on this incredible experience in the swamps of Louisiana. When looking for different excursions in New Orleans you may worry that there are not as many options for the younger members of the family. But, the best part about taking a New Orleans airboat tour is that you can bring the whole family. 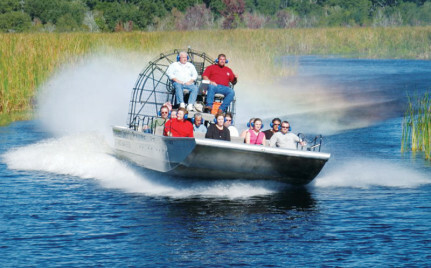 With two different airboat tour options that can accommodate you and your 29 closest friends and family, you can opt for a small boat tour which fits 6-8 passengers or go big with a large boat tour which fits 15-30 passengers. Taking a New Orleans airboat ride is guaranteed to be an unforgettable experience. You’ll be able to tell your friends all about the adventures you had while boating in the bayou. Enjoy the beautiful bayou landscape and maybe even meet some new creatures along the way. Booking your New Orleans airboat tour with Airboat Adventures will be sure to please the whole family on your vacation. And did we mention we’ll pick you up at your hotel? Hop on board and book your airboat tour today! Give us a call at 504-689-2005 for prices, reservations, and pick up arrangements. Come spend some time on the bayou and Airboat Adventures, it’s sure to be an unforgettable experience!